Huon Aquaculture Group Limited (Huon or the Company) today advised that it had lodged proceedings in both the Federal Court, seeking compliance and enforcement of the conditions imposed by the Federal Minister of Environment’s Decision of 2012 that permitted the expansion of salmon farming in Macquarie Harbour, and the Tasmanian Supreme Court, seeking a review of the Tasmanian Environmental Protection Agency (EPA)’s regulation of Macquarie Harbour and, in particular, the biomass cap as determined by the EPA in January 2017. Specifically, the Company has lodged proceedings in the Federal Court against; the Secretary of the Department of Primary Industries, Parks, Water and Environment (DPIPWE); and the Director of the EPA (EPA), and the Minister for Environment (Commonwealth) that seek declarations and orders enforcing, or in the alternative quashing, the Minister’s Decision of 2012 that approved the expansion of salmon farming in Macquarie Harbour (Minister’s Decision). The basis of the application in the Federal Court is that the Company says that DPIPWE and the EPA are failing to comply with conditions imposed by the Minster’s Decision that were intended to ensure that marine farming was properly and effectively regulated and that measures would be taken, as necessary, to ensure that there were no negative impacts on the World Heritage Area or the habitat of threatened species. The proceedings in the Federal Court also seek a determination on the validity of the Minster’s decision in relation to whether the conditions are effective and enforceable. In the Tasmanian Supreme Court, proceedings have been lodged against; the Director of the EPA, the EPA, and the Tasmanian Minister for Primary Industries and Water that seek to declare the EPA’s biomass decision of January 2017 as invalid on the basis that it fails to set a sustainable limit on biomass in Macquarie Harbour as is required by the Marine Farming Planning Act 1995. Importantly, the Company is not seeking damages (i.e. suing the Government), simply appropriate application of the legislation and regulation as it applies to marine farming in Macquarie Harbour. In so doing, the Company is seeking to ensure Government decision making is transparent, fair and has a clear eye on a long-term sustainable future of the waterway. 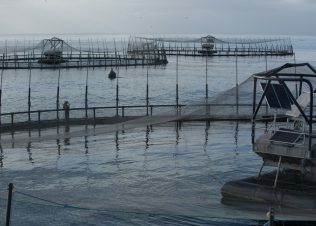 Huon Aquaculture Co-founder and Executive Director Frances Bender said that, whilst it was a strong course of action to take, the Company believe that it has exhausted all other avenues prior to launching these court proceedings and is determined to ensure the long term future and sustainability of Macquarie Harbour is protected. “As I said in November, our actions speak to our ethos that we will not operate in a boom and bust cycle by placing too much pressure on the environments we operate in and that exposes us to long-term reputational damage and jeopardises the job-security of our employees,” she said. “We believe that Macquarie Harbour can be farmed safely for the long-term but to do that we need to act now, act responsibly and act in the long-term interests of our employees. “Our view is that the recent biomass determination made by the EPA Director fails to properly regulate marine farming in Macquarie Harbour and will cause ongoing deterioration of environmental conditions in the Harbour. “We believe the biomass should be set at or below 10,000 tonnes to give the Harbour the best chance to recover. “As a result, we are seeking two things; compliance and enforcement of the Federal Minister of Environment’s decision in the Federal Court, and for the Tasmanian Supreme Court to review and set aside the EPA’s recent biomass decision,” said Mrs Bender. A summary of the the court proceedings regarding Macquarie Harbour can be viewed here.